Spring has finally sprung and Melbourne Central is celebrating by holding a One Day Shopping Festival on Thursday 5th September. The centre’s first ever 12 hour shopping festival will feature a jam-packed program of interactive events plus over 200 offers from Melbourne central’s favourite retailers. Indulge at the MECCA MAXIMA Beauty Bar- receive free lip, lash and nail touch ups from MECCA consultants and a free beauty gift to claim in store. Melbourne’s favourite food trucks return to McIntyre Alley in a rare CBD appearance. This display traces the creation of costumes by Tony award winning designer Roger Kirk, as part of visionary hit stage production King Kong. Fashion and film collide with MSFW’s latest film project: Reflections. Be inspired by the new season cupcake flavours and have your nails decorated to match your favourite ones. Customers can also win fantastic prizes as part of the cupcake decorating competition. What I’m loving at the mo.. I love that the Shot tower used to be Melbourne’s tallest building and the builders got underneath it, re-blocked it and encased it in the glass tower when they built Daimaru! Time poor, working mother of two = a love of Melbourne Central as a one stop-shop – all my faves are under the one roof! 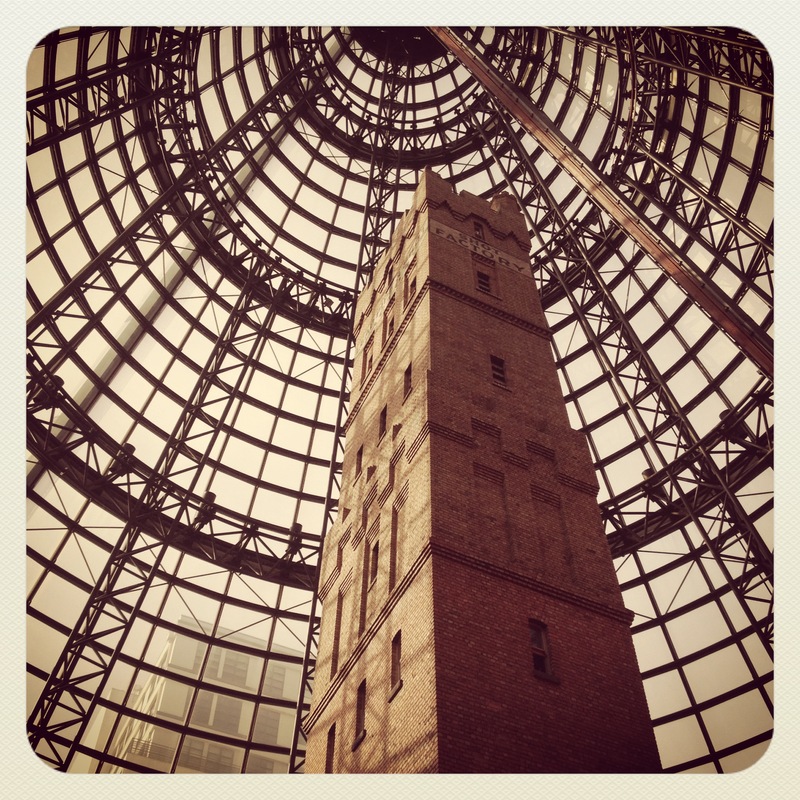 Natural light through the glass ceiling, the shot tower standing on guard. The underground right there, the vast array of shops, the tourists watching the clock perform… I love the overall Melbourne Central experience! I love how a dose of Melbourne Central window shopping on the way to the train station removes the stresses of my work day… and steels me for the train commute home! It’s great that one can shop for fashion, eat, go the movies, buy groceries, or get one’s hair cut all under one roof! Melbourne’s unpredictible weather need not matter when stopping by Melbourne Central. Love it. PS thanks for the write up on Melbourne Central’s One Day Shopping Festival.. didn’t know about that! And the shopping is fantastic!